The lady was amazed to find the reflection of her little son on her lap on the blue waters of the Yamuna that flowed with murmuring swiftness across the picturesque Gokul. The lady was none other than Yashoda…It was the first time she had taken her little Krishna to the ghats of the Yamuna…There was hardly any difference in the complexion of his son and the blue waters of the Yamuna. Krishna was gurgling and laughing… his little hands were trying to point towards the beautiful herons and stalks that were hovering over the shallow waters of the river…Yashoda was a proud mother…..she could not even think off for a moment without taking care of her son Krishna…Krishna was her world…Her spell was cut short with Rohini approaching her in quick pace….she remembered that post lunch the two ladies had to finish their assignment of giving a final touch to pack the 300 vessels of sweet meats that Nanda Maharaj was supposed to send to the court of Raja Kamsa along with other items like food grains, spices, butter, milk…she thought it was a cruel on the part of Kamsa to force the poor people of Gokul pay hefty taxes..when they had so many problems to deal…Yet amidst all these Yashoda was happy that she had Krishna..and somebody in the corner of her mind said..that things would change…and better days are soon to come for the people of Gokul…..
Mathura, Vrindavana, Gokul, Barsana and Nandagaon are immortalized by the memoirs and adventures of Lord Krishna and his heroics that you must have read from the pages of the epic Mahabharata….We had a long cherished dream to visit Lord Krishna’s birthplace and when the opportunity came to us last year during the Dashera holidays we grabbed it immediately. Millions of people from various corners of our nation and abroad visit Mathura-Vrindavan as a major “Tirtha Yatra” or a tour for seeking religious salvation. 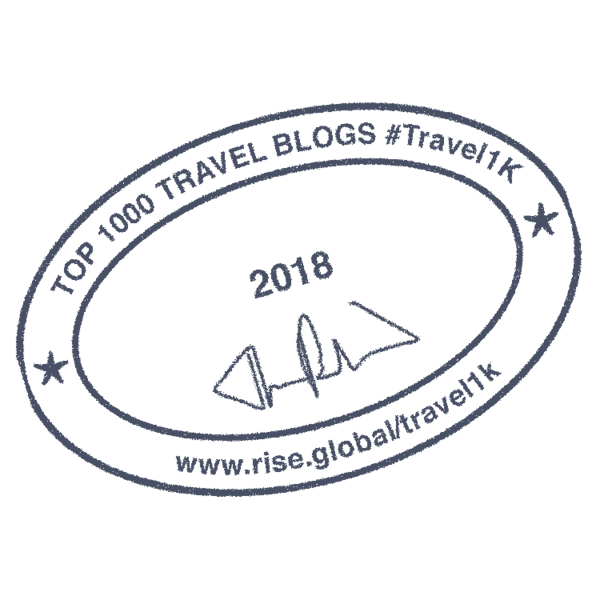 The objective of our tour was not only to pay respect and homage to Lord Krishna, but to have a deep insight to the origin of the epic saga that shaped the course of the future of the modern Bharata or India…. We started off early in the morning from Hazrat Nizamuddin station boarding the Taj Express that sailed us to the Mathura junction at around 9.15am. 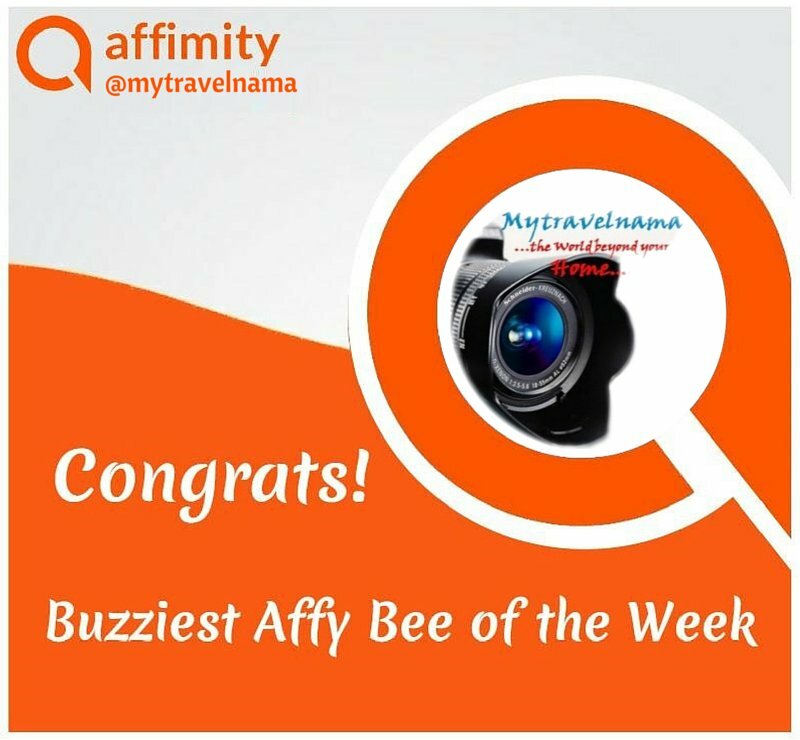 We had our bookings at a not-to-be famous lodge located near to the ISKON Temple of Vrindavana…It was festival time and there was hardly any vacancy in and around Vrindavan. Thanks to the Tourist Information Office of the ISKON temple, our day’s tour was well organized in a very comfortable tourist vehicle. 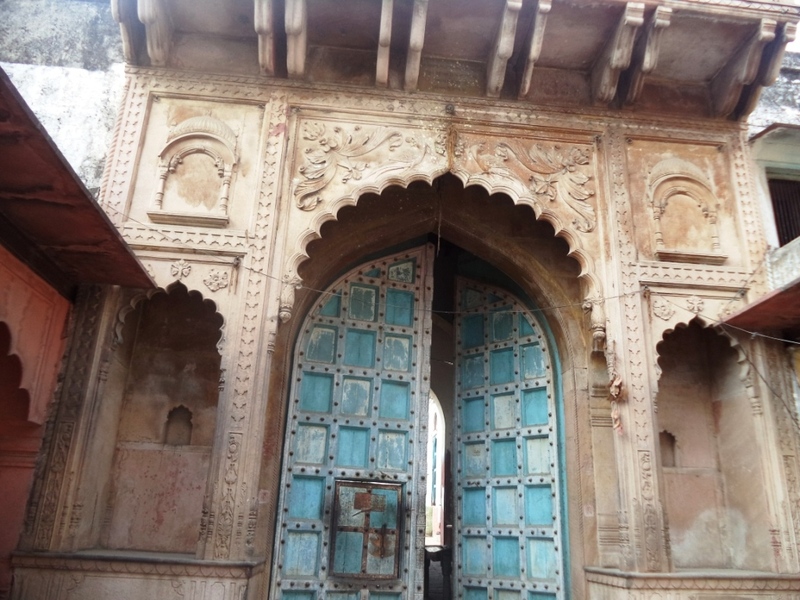 We started with Gokul, which still….still has a traditional serene aura around its narrow lanes, old havelis (villas)…that reminds you now and then of the rich heritage and culture of the bygone era. Thanks to Lord Krishna that, the shameless consumerism and Mall culture of the Urban India is yet to have their toll on this important historic and mythological town. Our car took a left turn from the Mathura-Agra highway, crossed the beautiful Yamuna (Gokul Barrage)..and led us into Gokul….The narrow lanes inspite of the rush time was hardly busy..the villas around us looked so similar to those of Kashi…There were lots of monkeys hovering around…busy with their playful monkey business….It was hardly another two minutes before our car left us in front of the Putra Kund…beyond which we had to be of our own. We were immediately surrounded by anxious guides, with so many stories which they proudly claimed to share with us. 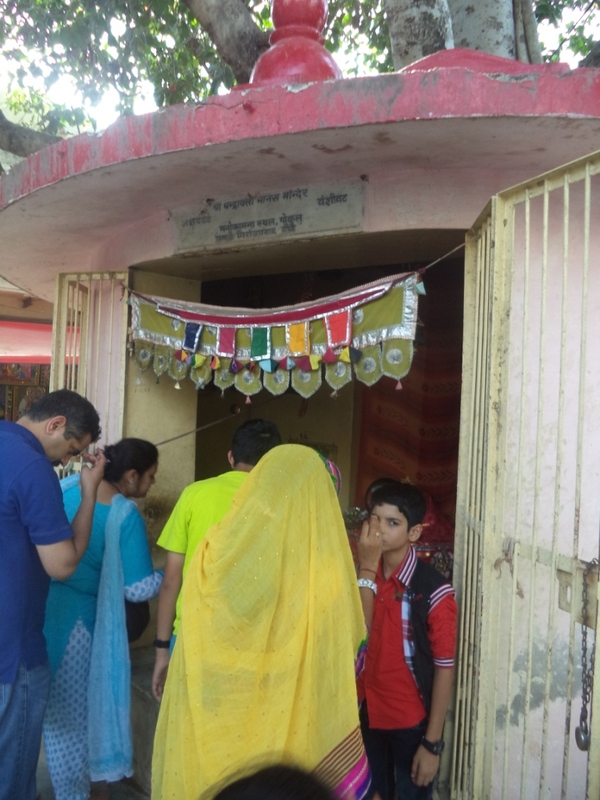 After thankfully obliging their efforts, we proceeded towards the bathing ghat of Putra Kund. 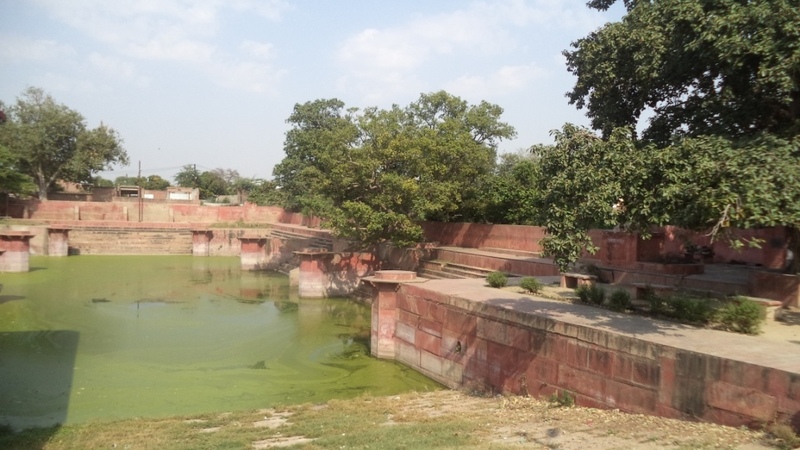 Putra Kund is more of a pond with bathing ghats all around. 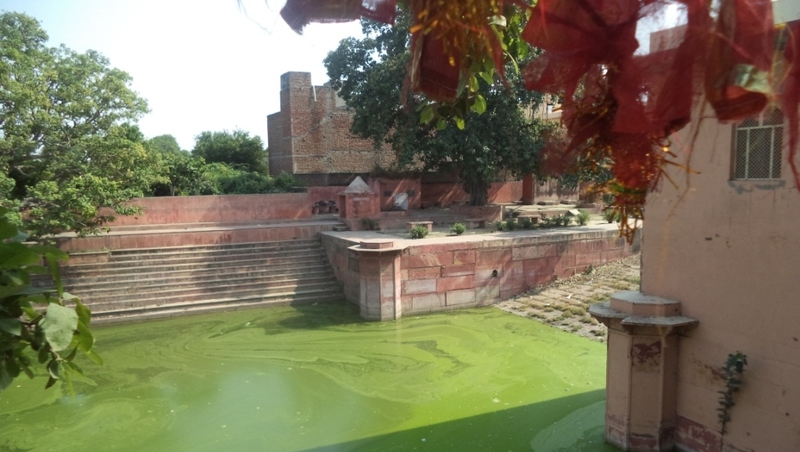 The place is claimed to be holy by the devotees as it was perhaps used as a place for cleaning the nappies of baby Krishna and his elder brother Balarama…The pond is surrounded by some old banyan trees that are used for offering pujas…The water looked severely polluted, green with algae…it showed that the civil authorities hardly paid any attention for ensuring its preservation. 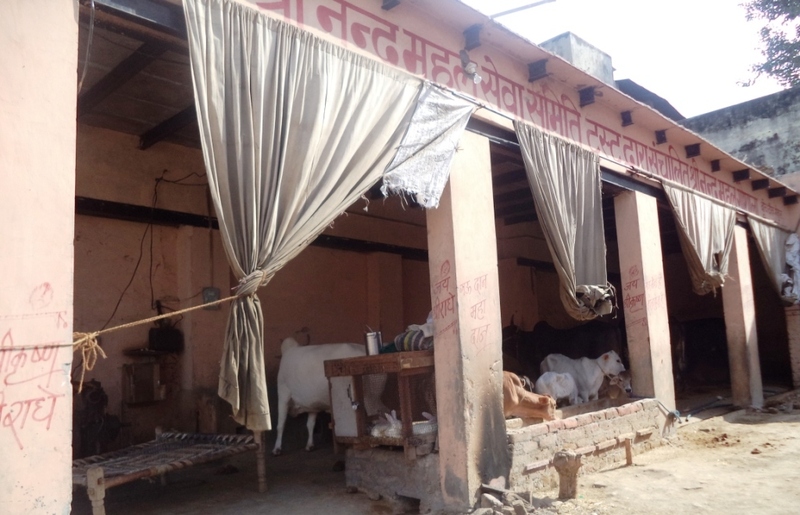 There was something unique about some of the old sweet meat shops in and around the Putra Kund. Some of them were more than 50 years old. 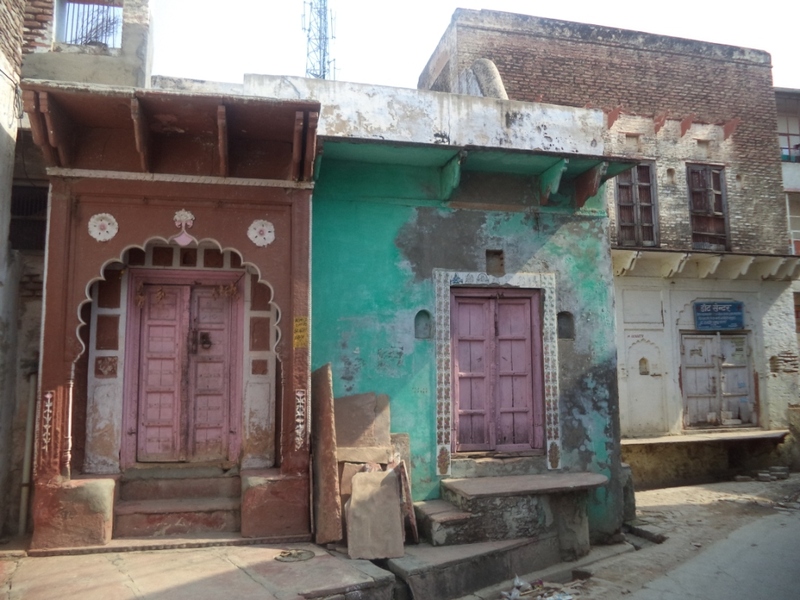 Later in the day we found the Pedas and Kheers of the nearby Nityananda Mistanya Bhander with amazing taste. 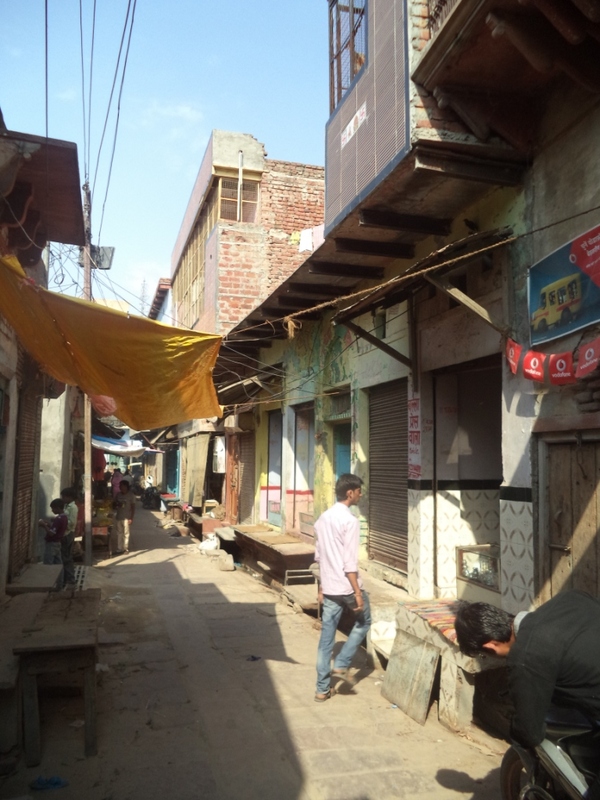 We took the narrow lane from Nityananda Mistanya Bhander leading us to the centre of the holy town “Srimad Gokul”. A beautifully painted arched gate awaited us. 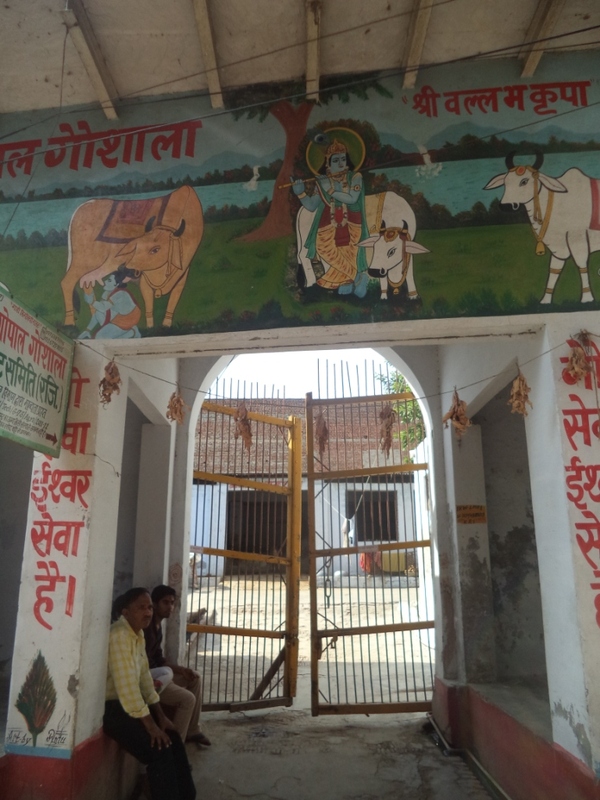 The elaborate murals spoke of Krishna’s boyhood days with the cow-herds of Gokul. A little ahead and to our right, we found the “Sri Gopal Goshala”. 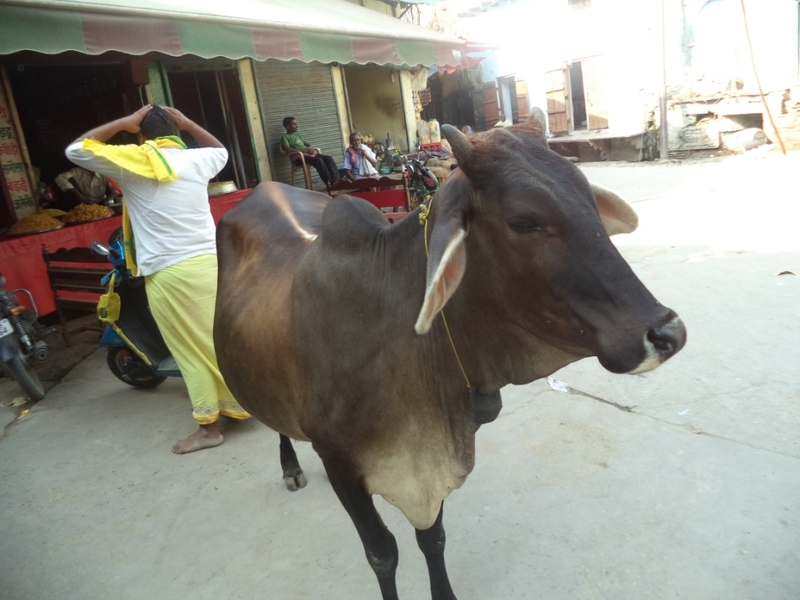 It is said that Nanda Maharaj, popularly known as Nanda Baba, had donated 9 lakh cows to the people of Gokul to celebrate Krishna’s birth. 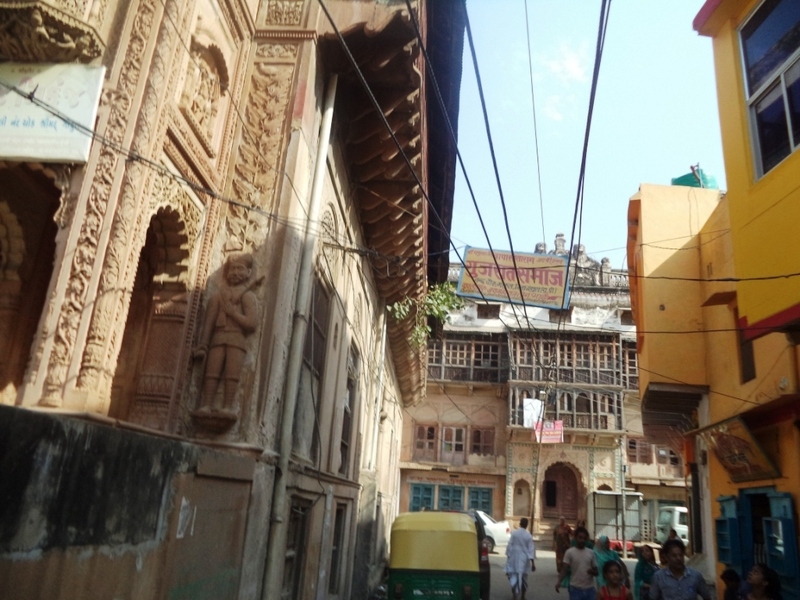 There was something very majestic of an aura in the culturally rich old havelis surrounding the narrow lane leading us to Srimad Gokul. 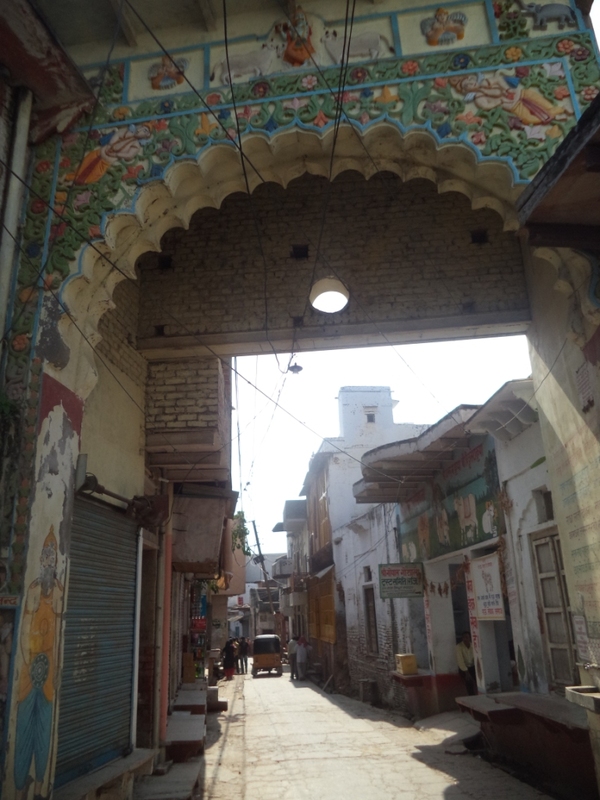 The gigantic wooden gates, the arched entrance, the wooden panel works, multi-coloured walls were too good to digest. Guys this lane is a treat for snap lovers. We made some humble attempts for some shots out here…. 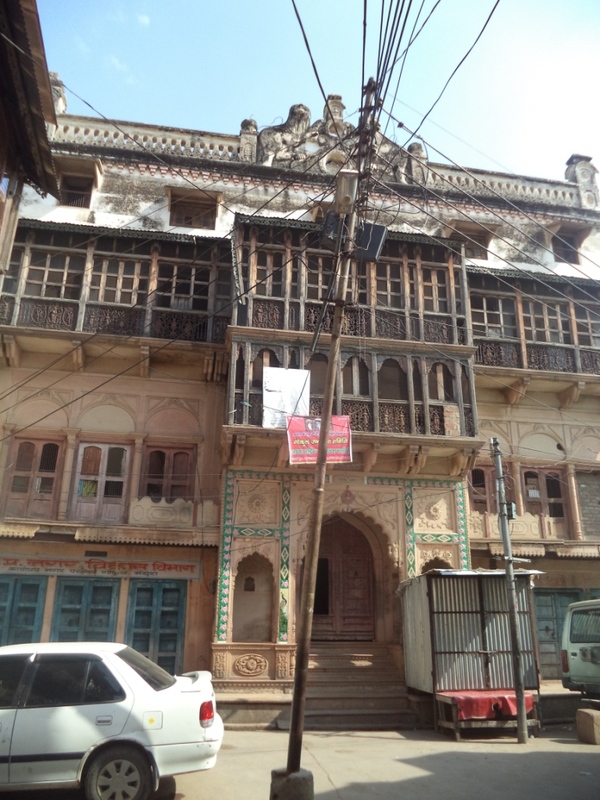 The majestic Krishna Dwar soon welcomed us into the Nand Chowk which connects the Krishna Dwar with the core of Srimad Gokul, housing the claimed residence of Nanda Maharaja and Krishna-Balarama. 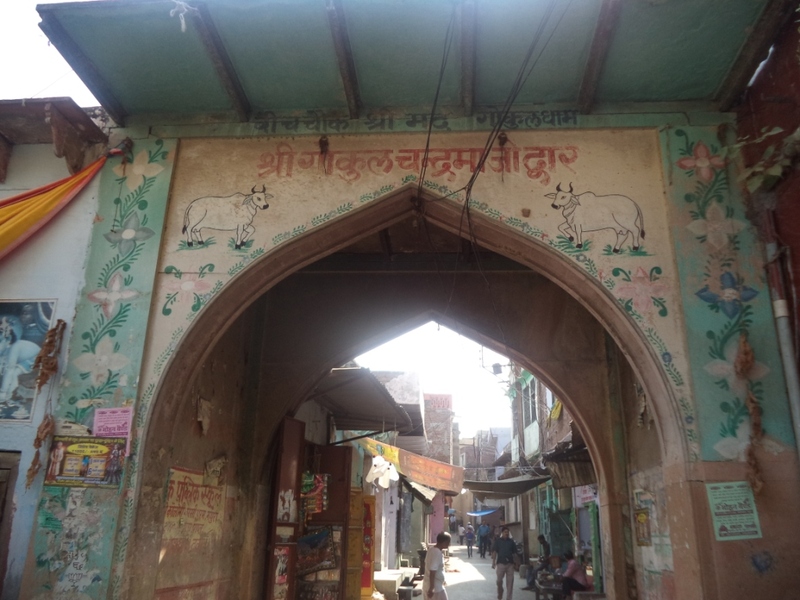 There was an unique message written on the walls of this famous gate which had urged pilgrims and tourists to maintain a clean and hygienic Gokul for a better environment. This was perhaps the true realization of Lord Krishna’s vision of a cleaner and healthy Bharata which he might have preached the people of Gokul and Vrindavana 5000 years ago. 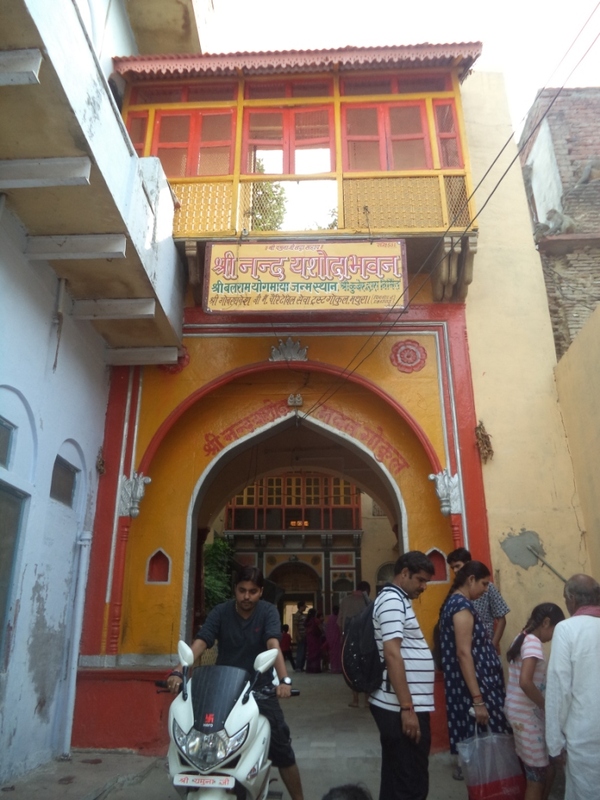 After walking a few yards ahead we came to a courtyard centred by a small and famous temple – the Sri Chandrabali Manas Temple. Devotees flock to this temple to offer prayers to Devi Chandrabali and seek her blessings for fulfilling their wishes (Manokamana). After leaving the Sri Chandrabali Manas Temple behind us, we came across the Sri Gokul Chandramaji Dwar. 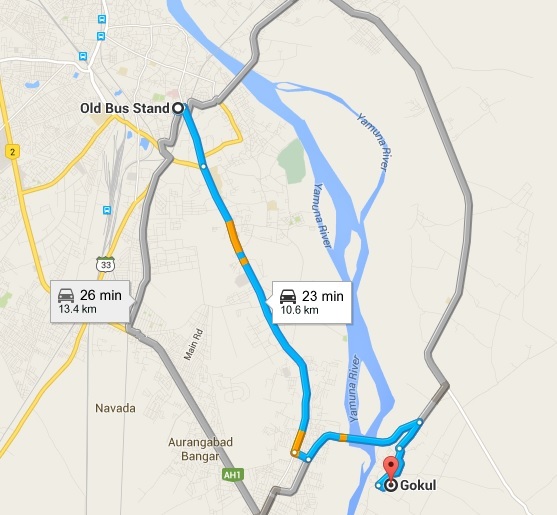 We knew that we were very near to the fabled place where Lord Krishna and Balarama had spent their early childhood. 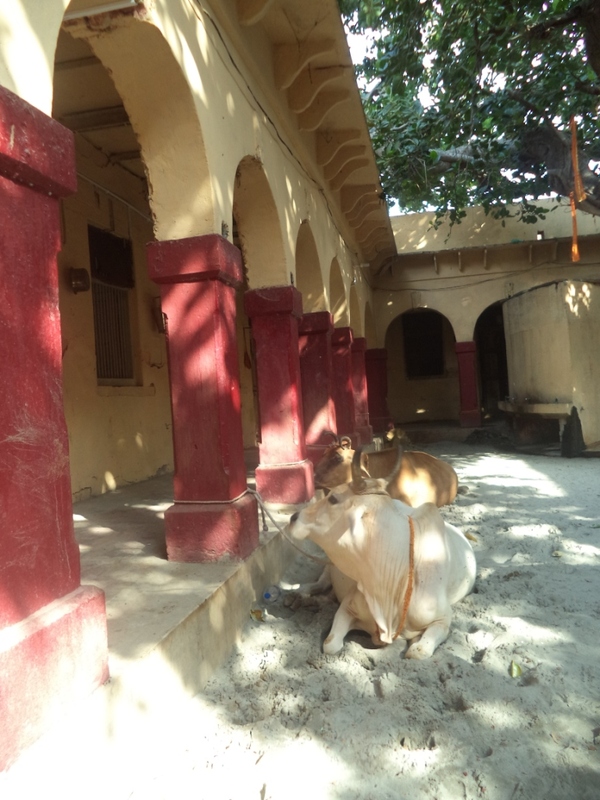 Taking the Ras Chowk we soon came across a beautiful cowshed popularly known as the “Nanda Mahal Goshala”. 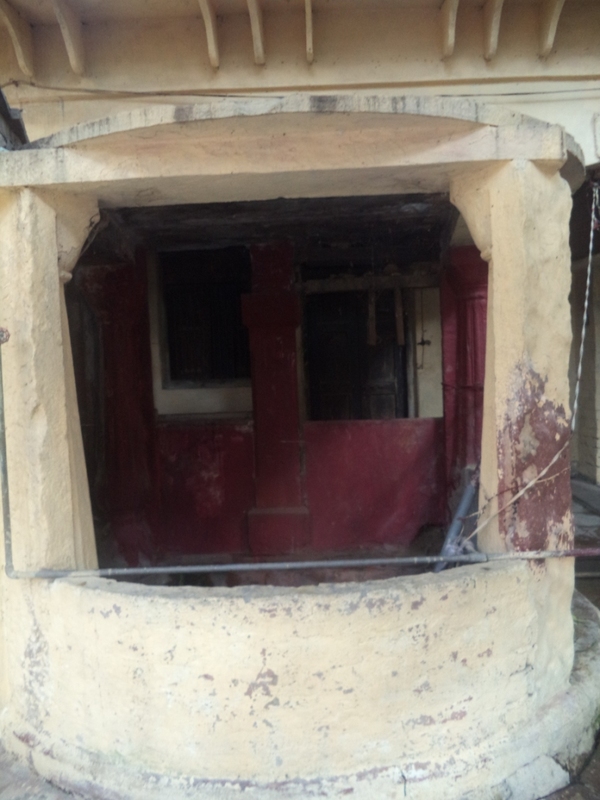 In ancient times this Goshala was perhaps a part of Nanda Mahal or the residence of Nanda Maharaja. 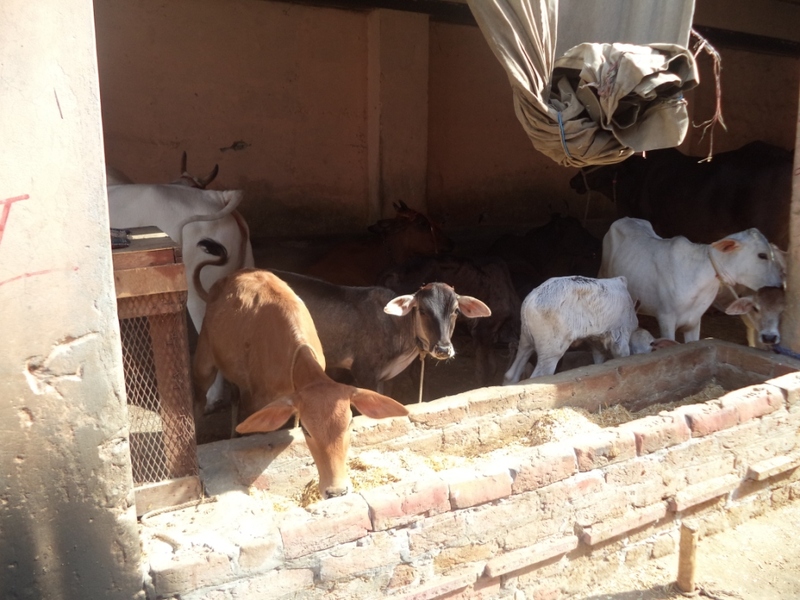 We were thrilled by the sheer thought that the lord himself was in charge of this Goshala. 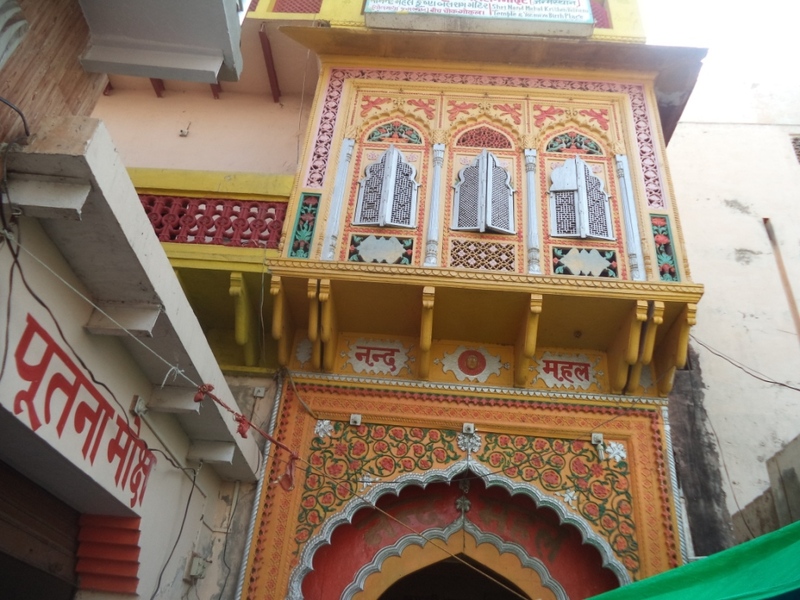 At present the large pink-yellow coloured two storied mansion located to the right of Nanda Mahal Goshala is claimed by the local people of Gokul to be the fabled residence of Nanda Maharaja and Lord Krishna. 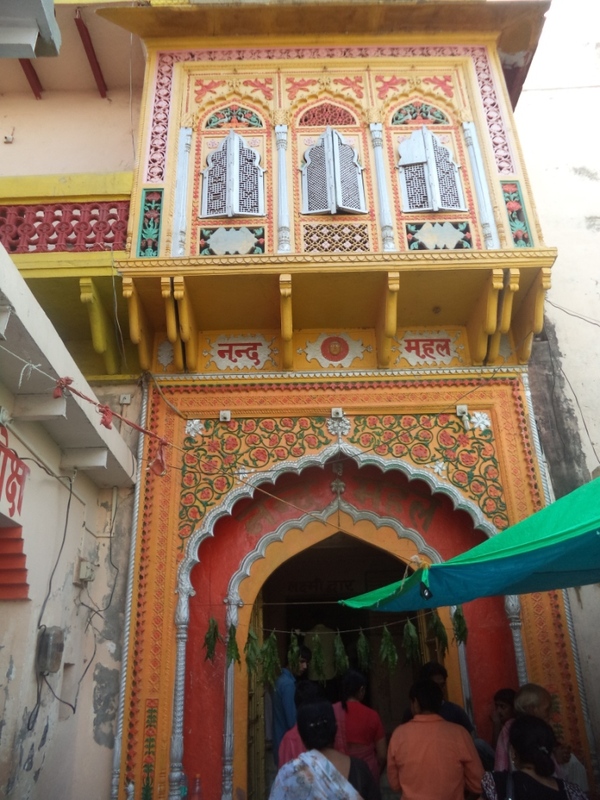 Before entering the mansion to our left, we found a small antechamber room, which is claimed to be the famous “Putna Moksha” – the divine chamber where the lady-rakshasha Putna was slain by baby Krishna. 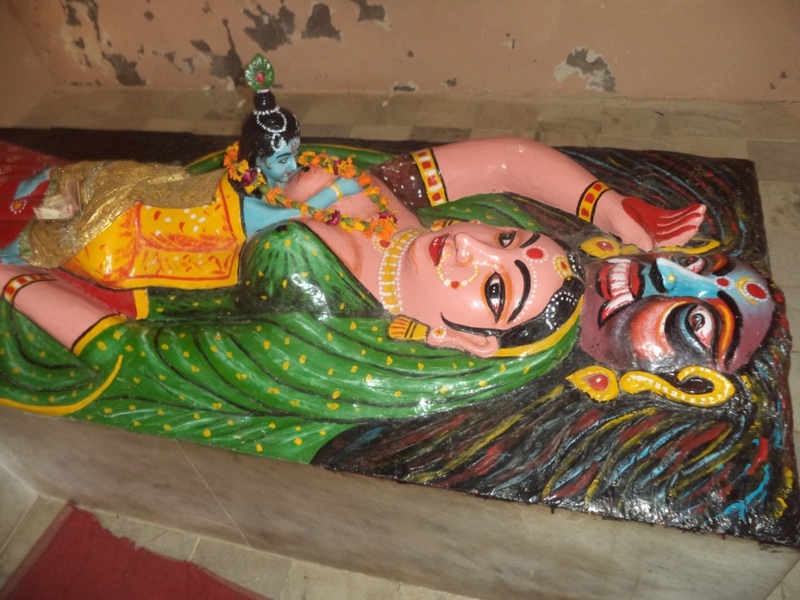 The ferocious lady-rakshasha Putna was sent to slain the 8th son of Princess Devaki (Lord Krishna) by the evil king Kamsa. The lady-rakshasha disguised herself as a beautiful lady, visited house after house in and around Mathura and Gokul and killed hundreds of innocent babies who were born on the auspicious night of Janmashtami (Lord Krishna’s birthday). 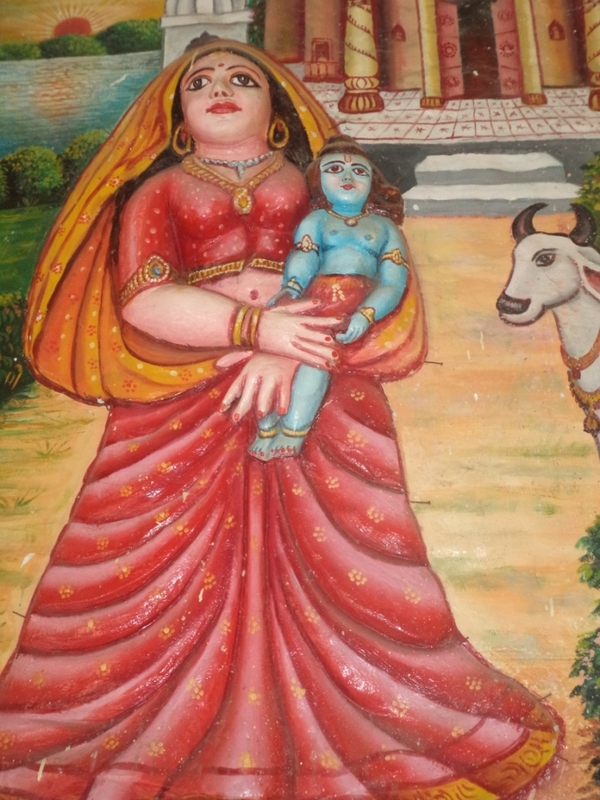 On the penultimate day, when Putna made an attempt to poison baby Krishna by breast feeding him…he sucked the life out of the demon and put an end to her evil deeds…. 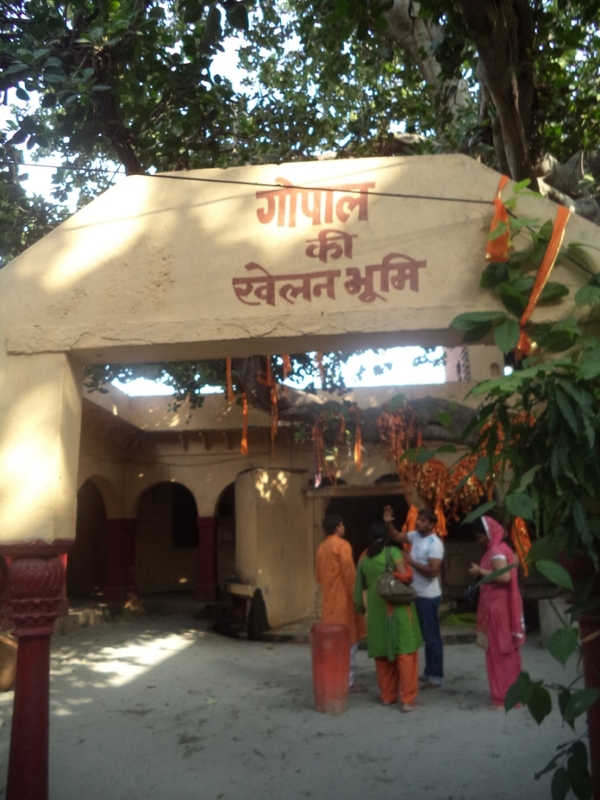 Near to the entrance of the mansion and to our left, there was a small sandy courtyard known as “Gopal ki Khelan Bhoomi” or the playground of baby Krishna (known as Gopal). 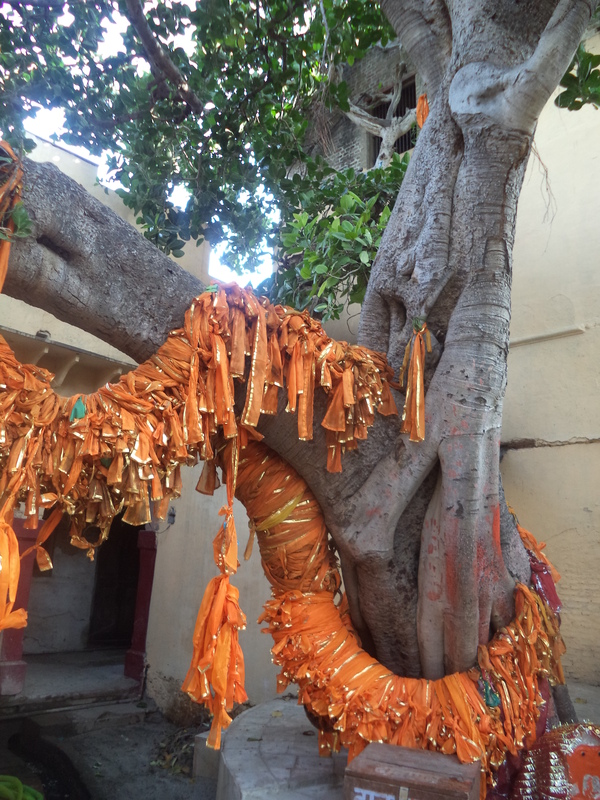 The playground houses a very old banyan tree and a humble Indian well beside it. 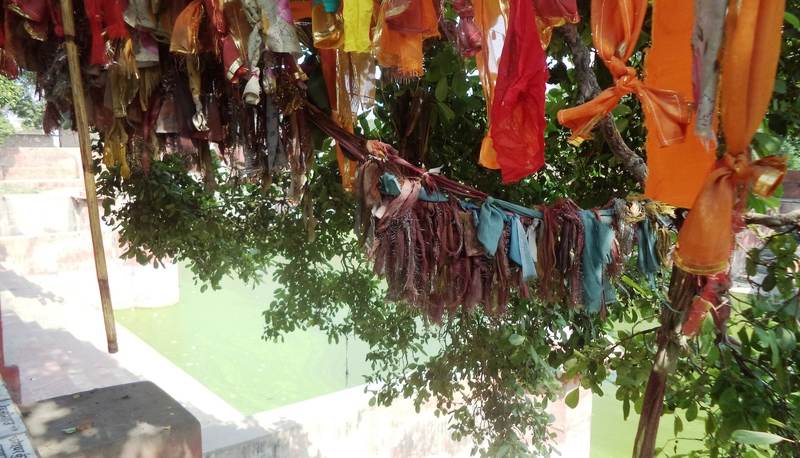 There are innumerable stories of Krishna’s naughty playfulness around this courtyard and tree when mother Yashoda used to be busy in managing her day to day household chores. Was this well located at the Gopal ki Khelan Bhoomi used by Yashoda??? 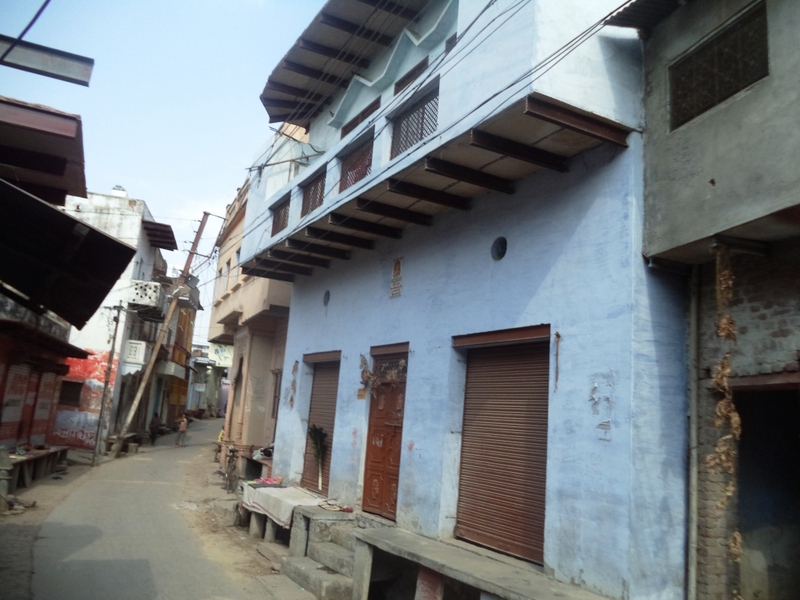 The Nanda Yashoda Bhawan is nowadays used as a temple for worshipping Lord Krishna. It would be incomplete of a narration, if we do not describe you the aura of its sheer elegance and aesthetic beauty which even surpasses many of the Rajput palaces you may encounter in and around Rajasthan. 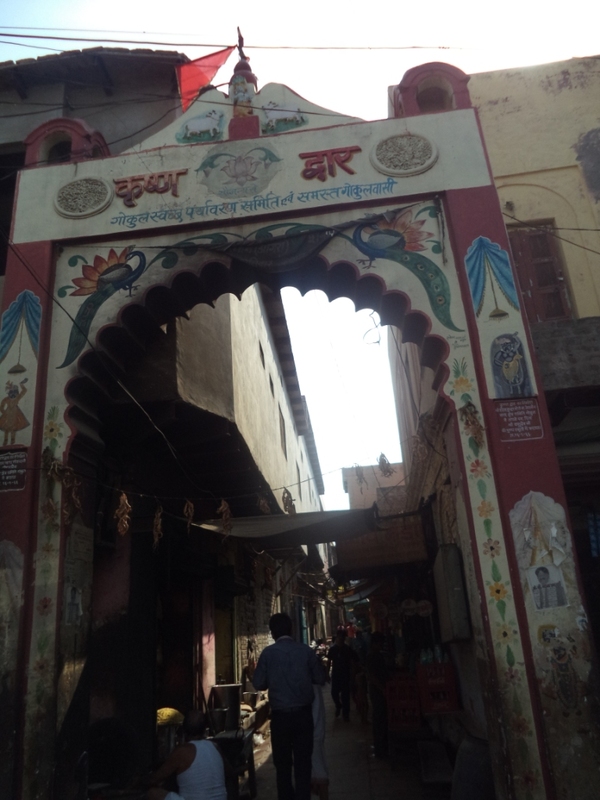 On our way back towards the car parking space near to the Putra Kund, we stopped at the Nanda Baba Gali to purchase a few mementos. 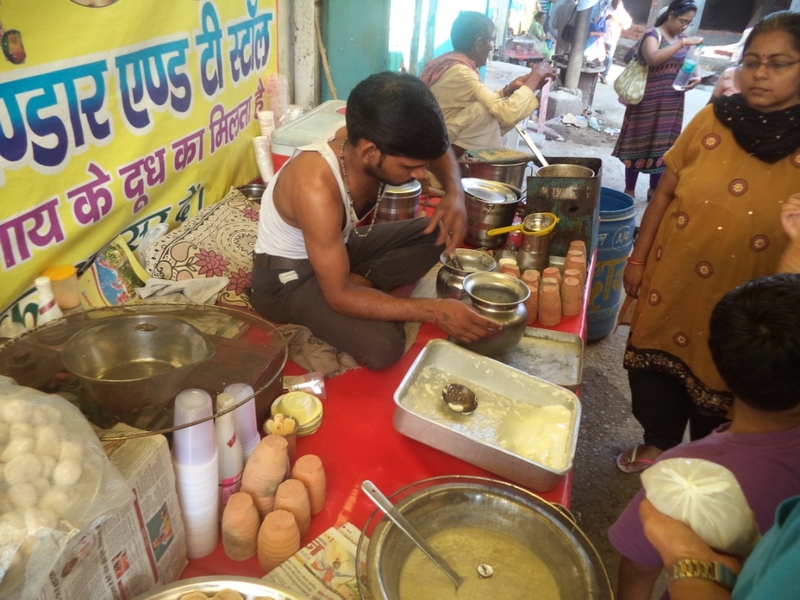 We observed that that apart from memento shops, the place housed a number of sweet shops and stalls, out of which majority had kheer, home-made butter and creamed lassis as special items which were particularly favourite to Lord Krishna. 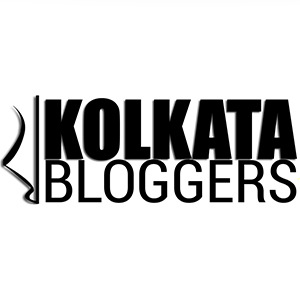 We could hardly resist ourselves from having a gulp of a plateful of Kheer and creamed lassi. Leaving Srimad Gokul was painful for us. We were madly in love with the Lord and his birthplace. There was something extra ordinary, out of the world in the brick and mortar which we found around us. The Lord was gone with his Godliness and the immortal lessons he taught us during the Mahabharata. 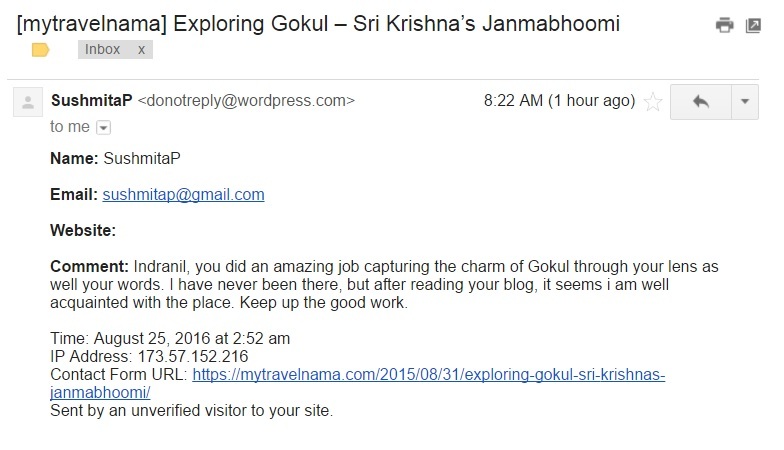 Yet he was there… so much…universally everywhere around us at Gokul. His playful mischievous acts, joyfulness, dedication and pure love for people and the living world… created the aura that immortalized Gokul and its people for ages gone far back in time and would remain to do the same in the eras to come.